Kids these days, am I right? We can't hold down a job, we expect to be promoted before we've proven ourselves and we put our career needs before the needs of an organisation. We're the largest age group making up 37 per cent of the Australian workforce yet we're expected to sit down, shut up and wait our turn. What is it about millennials that has everyone scared? Ageism in the workplace isn't new. As a society, we've always discriminated against people based on age. We've traditionally believed that being 'old' means you are weak and out of touch and being 'young' means you're vulnerable and naive. However, recent structural, economic and demographic changes have created new types of ageism that are more subtle and widespread. One notable change is the presence of two large, culturally distinct generations — millennials and boomers — in the workforce. As boomers are working longer, they are having to share the boardroom table with a new generation who are trying to get an economic foothold. This is where the negative perceptions start. Each generation views work and, therefore, approaches their career in a different way. Boomers often perceive millennials negatively because they don't understand their working style, while millennials want to experiment more at work and see boomers as a barrier. In the same way that boomers were shaped by the events of World War Two, young peoples' behaviour in the workplace has been influenced by their experience of the global economic crisis and political instability. Unable to influence some of society's biggest challenges, including income inequality, house affordability and unemployment, millennials feel they can have a greater sense of control and make a positive impact within the workplace. But unlike boomers, young Australians want more than just technical knowledge. They want the ability to identify and solve global problems in the workplace. Specifically, they want to solve problems that the boomers and those before them created. And this is where the tension arises. Nearly 40 per cent of millennials believe that older senior management doesn't relate to younger workers and 34 per cent feel that their personal drive is intimidating to other generations. "Millennials want to disperse power, not hold onto it. And for a workforce that's built on an authoritarian, rules-based approach, letting a large, educated, well-connected and socially conscious group have a seat at the boardroom table can be scary." One young Australian, 23-year-old YMCA employee Anthony Secodulidis, sums up what's wrong with the current way we view young people in the workforce perfectly. 'There's a huge amount of interest in youth engagement but it's so much more than just providing a ping-pong table and some bean bags for your staff. Young people want the opportunity to be heard and to have hands-on experiences,' says Secoulidis. Employers are also setting unrealistic requirements for entry level roles and aren't willing to provide meaningful training and development opportunities. The question then shouldn't be: How do we engage young people in our workforce? Instead, we should be asking: Why are we focusing on engagement and not the underlying issues? Young Australians believe that business has the power to make a difference. And they want to make the world a better place through their work. But unlike boomers, millennials believe in inclusive, consensual and collaborative work environments rather than one that directly links accountability and responsibility to seniority. And here lies the problem. Millennials want to disperse power, not hold onto it. And for a workforce that's built on an authoritarian, rules-based approach, letting a large, educated, well-connected and socially conscious group have a seat at the boardroom table can be scary. Better to not let them participate at all. Thanks for the thought provoking article Rachel. As you are no doubt aware, making generalisations about boomers and millennials is going to have advantages and disadvantages. I think it's important to stay aware that many of the good characteristics of millennials exist in boomers and vice versa because they are human characteristics that have existed in all cultures throughout history. If they didn't, society would be fairly dysfunctional. 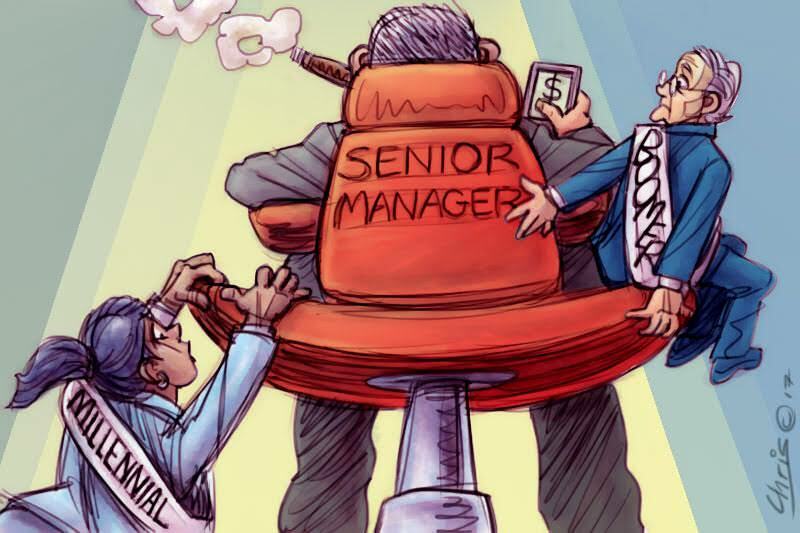 From my own recent career experiences, I would say bosses preferred to employ young malleable, ambitious millennials rather than older, experienced people who knew when they were "being taken for a ride" and were prepared to question directives from on high. These boomers were very willing to mentor the young - to share the power. They passionately believed in team work, inclusiveness, diversity and above all, the success of future generations. But I acknowledge my own experience is not replicated in all other workplaces. Personally, I don't think we should view the workplace through the almost passé marketing device of "baby boomers, gen X, gen Y, millennials etc" though I acknowledge it can serve some purposes, such as helping us to explain some social characteristics. I recently saw people close to me lose many thousands of dollars simply because a group of young, inexperienced (that's OK, we've all been inexperienced at different times) people swept into power in an organisation. They got rid of all the seniors who had any influence in the organisation. With that one gesture, they completely cut themselves off from many years of corporate history and good will. So sad. I am afraid I greatly empathise with the balanced and nuanced comments of Anne Shannon rather than the sweeping generalisations of the article. Regarding just one point, namely ageism, I can testify that "senior managers, who often are responsible for hiring, have a more positive view of senior workers....etc" is not the only situation encountered by people seeking work. A number seem to outsource their interviewing and selection processes to panels of employment consultants who are too young to know how to value senior workers, and who think their klnowledge is outdated (without any real test thereof), or that they just will not fit in with younger workers. Further, in my observation the phenomenon of "unrealistic requirements for entry level jobs" is not merely a prejudice of the hiring organisation but the result of a system that has produced far too many over-educated applicants to match the reality of the entry jobs available. I'm almost a Boomer and I find that the Millenials bring out the best in me in a working environment. Yes big decisions benefit from experience, but they can also be stifled by experience. Millenials, always bring your ideas, innovation, energy, confidence, and openness to the table. Don't wait. Don't ask pernission.